In the Midwest premiere of “Rest” by 2014 MacArthur “Genius” grant recipient Samuel D. Hunter, a character expresses his disdain for jigsaw puzzles. He professes he enjoyed them until he realized the banality of the entire process. A company takes an already known picture, creates the puzzle and leaves him with the task of putting the pieces together. As a result of this realization, he abandons the puzzles and resorts to watching television as his pastime. While I agree with the banality of the jigsaw puzzle, I believe it is analogous to our lives. We are somehow put here by a force higher than ourselves (the company), with a plan already set out (the picture), yet our responsibility for the remainder of our lives is to assemble the pieces together (the jigsaw puzzle). The characters in Hunter’s play realize that this responsibility, no matter how banal, is no easy undertaking. In a retirement home on the night of a record-breaking blizzard in northern Idaho, ninety-one-year-old resident Gerald (William J. Norris) has gone missing. He is presumed to have wandered off as a result of his twelve-year battle with dementia. 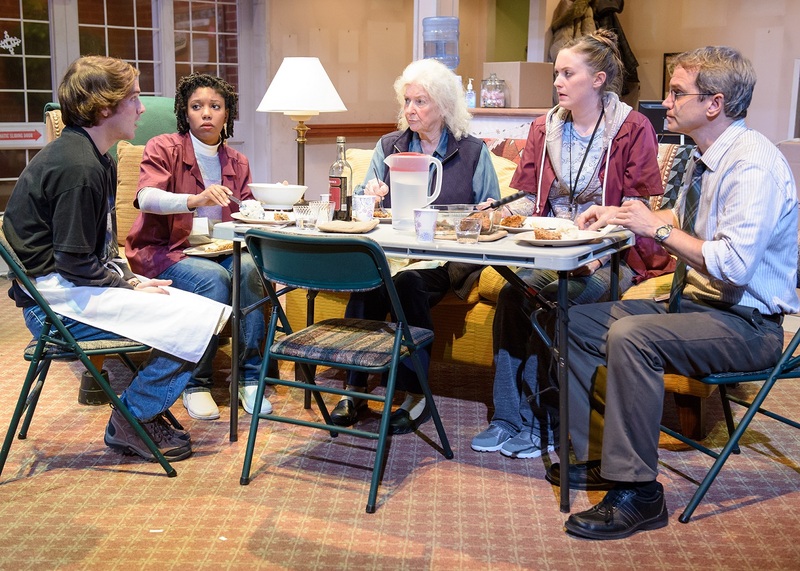 The staff, which consist of a temporary cook named Ken (Matt Farabee), two longtime employees—Ginny (McKenzie Chinn) and Faye (Amanda Drinkall)—and director of the home Jeremy (Steve Key) gather around to support Gerald’s wife Etta (MaryAnn Thebus). After failed attempts to search for Gerald, Tom (Ernest Perry Jr.), a resident whom the staff has mistaken as deaf for the last several years, reveals the truth about Gerald’s disappearance. This revelation forces each of them to grapple with their own morality and the meaning of their existence. In a spacious theater like the Victory Gardens’ Zacek McVay Theater, Chelsea M. Warren’s set design is impeccable. She has somehow managed to create a friendly, relaxed environment in which to hold so much pain and sorrow. Joanie Schultz’s direction is skillful, providing a lovely balance between the heart-wrenching and the hilarious. Adding to this, the performances are memorable with William J. Norris’ brief yet harrowing performance of someone living with this devastating disease simply heartbreaking to watch. MaryAnn Thebus’ ability to tackle every emotion of someone watching a loved one who can no longer hear the melodies that once dominated their life, is equally genuine. And Steve Key’s comedic physicality and timing brings so much joy to what could have been a story dominated by doom and gloom. Victory Gardens Theater, 2433 North Lincoln, (773)871-3000, victorygardens.org, $20-$60. Through October 12.